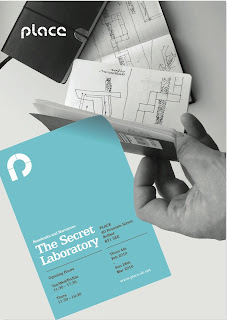 PLACE Blog: Notebooks and Narratives: The Secret Laboratory Launch Thurs 4th Feb! Notebooks and Narratives: The Secret Laboratory Launch Thurs 4th Feb! Next Thursday, PLACE launches its new exhibition, produced in association with the University of Ulster. Notebooks and Narratives: The Secret Laboratory reveals the hidden world of the architect’s sketchbook. This selection of work by local, national and international architects from Ireland North and South shows the quality of ideas, observations, thoughts and reflections that are often concealed in a drawer in the studio, a coat pocket or in the individual imagination of the architect. What ideas do we carry with us in our pocket? How do we use the ‘device’ of the personal sketchbook/notebook? How has its use changed with time and the digital age? Revealed now in The Secret Laboratory: a series of private reflections made public. The architects whose work is featured range from practitioners to writers, lecturers, critics and artists. The Secret Laboratory is a joint exhibition between PLACE and the University of Ulster, curated by Paul Clarke and co-designed and built by Niall O’Hare. The exhibition continues from 5th Feb til 27th Mar 2010. John Piekaar is a maker of ﬁne bespoke furniture. His walnut cabinet which won 1st prize at the 2003 RDS National Crafts Competition was inspired by a piece of Japanese architecture and is on display in weePLACE. Ciaran Mackel returns with his discussion series looking at important issues in urban design, the built environment and the practice of architecture, on the evenings of Thurs 11th and Thurs 25th February. More details coming soon! Sign up to the PLACE Mailing List by emailing Mailing List to info@place.uk.net!